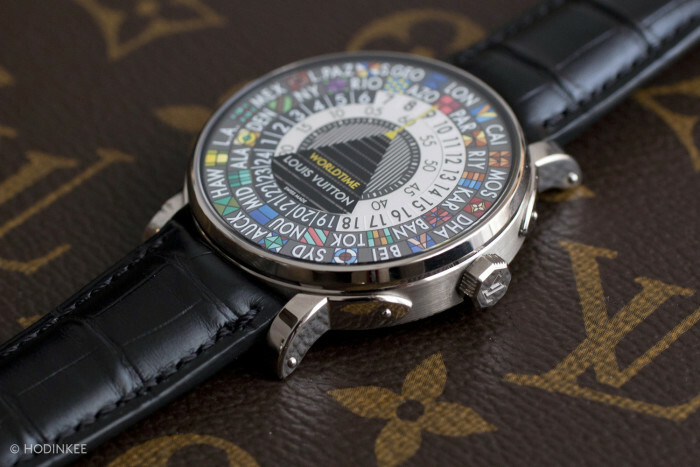 Louis Vuitton is serious about making complicated timepieces, this is the only reason they acqui-hired La Fabrique du Temps manufacture in 2011. 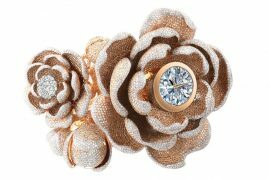 It didn’t take that long for the company to bear fruits of that purchase, as last year they introduced the Tambour Twin Chrono. Yesterday at Baselworld they unveiled their newest complication, The Escale Worldtime. 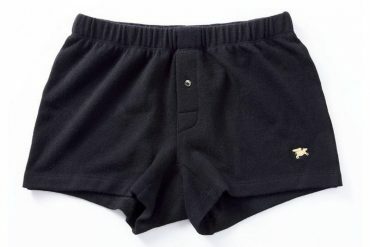 As with other Louis Vuitton products, it would be an anomaly if no mention is made of their famous trunk along with a travel related product. 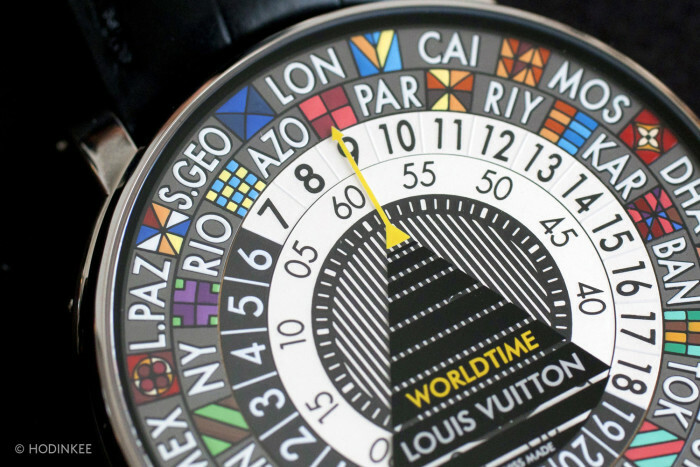 The Escale Worldtime features a vintage Louis Vuitton trunk monogram inspired hand-painted multi-colored dial. 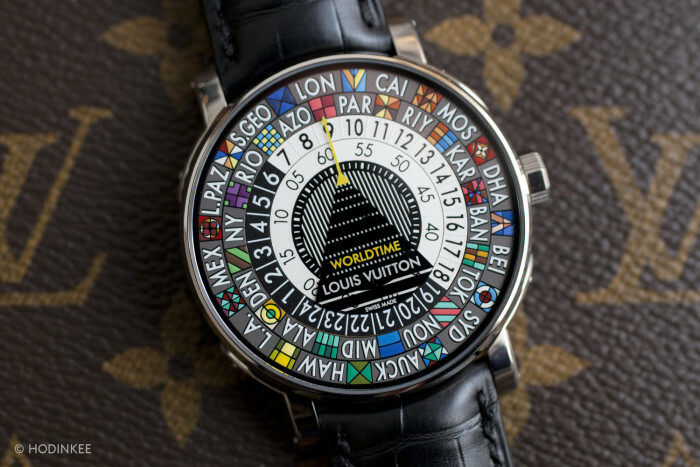 Dial is made up of four rings, two each for cities and times. 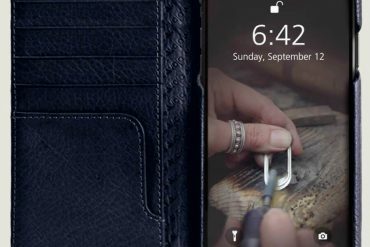 Each dial takes 50 hours of craftsmen’s time to hand-paint and fix rings. 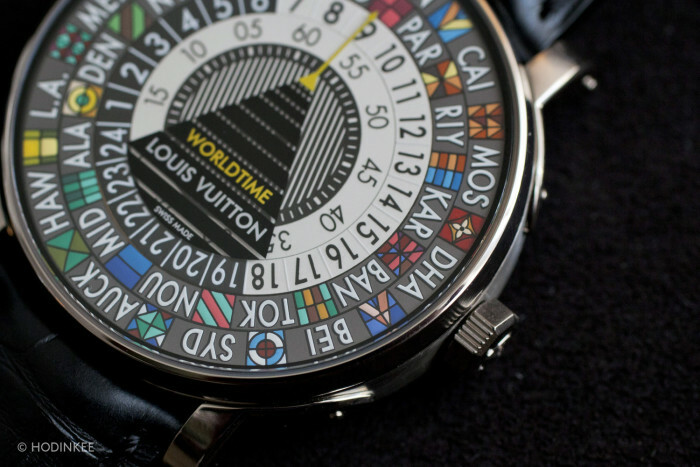 In all 38 are colors used on the dial. 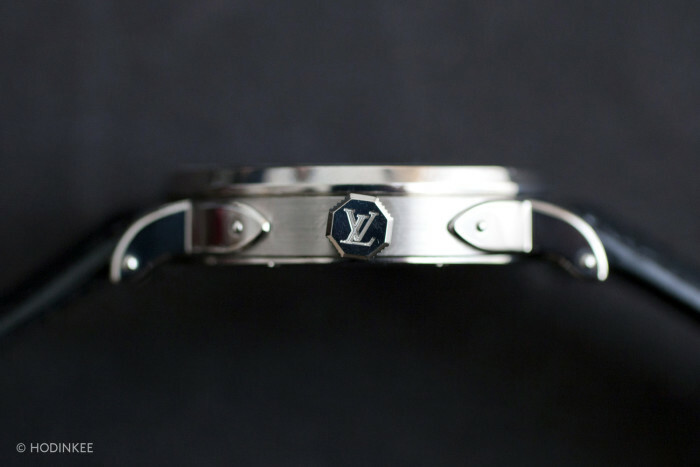 Louis Vuitton logo and the yellow arrow are applied to the bottom of the sapphire crystal and they hangs over the dial rings. 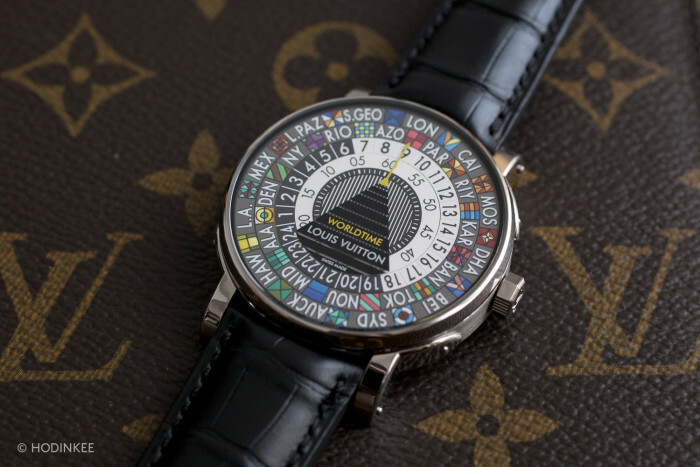 Most notable feature is you can read time for 24 time zones just by glancing at the dial. The yellow arrow at 12 o’clock is always pointed to local time. By using the crown, user can rotate city plates to line up home city to the yellow arrow, then set local time by using hour and minute plates located in the center. Other time zones then automatically aligns to their local times. 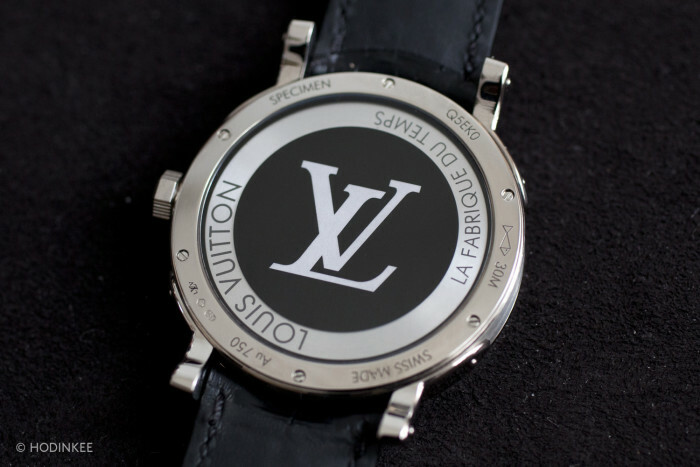 Encased inside the 41mm white gold case is in-house built new caliber LV 106 automatic movement. 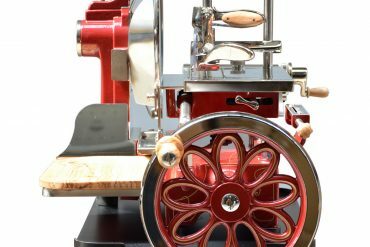 It provides 38 hours of power reserve. 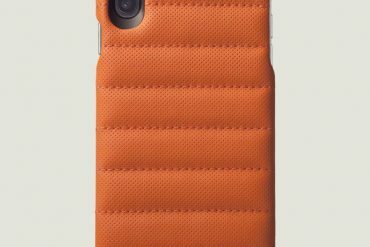 Details of the beautifully designed case include its slim lugs, a feature borrowed from the brackets of Louis Vuitton trunks. Though the movement workings are not fully visible from the case-back, rotor spinning is visible. 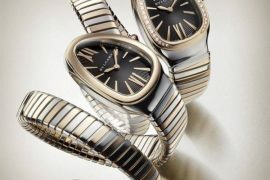 Luxury is not cheap especially if they are from LVMH, the Escale Worldtime is available at Louis Vuitton with a price tag of $67,500.